Do you want to learn how to align your putter and start making more putts? So many golfers skip practicing putting all together and if they do practice, it’s rarely working on alignment. It’s normally fun drills with friends or mindlessly putting towards holes. But even if you’re the best green reader in the world, without a properly aligned face, you will miss the putt almost every time. The ball has to start out on the right line to give yourself the best chance to get the ball into the hole. If you get in the habit of chronic misalignment, more serious issues can ruin your game for the long term. Because if you’re doing this on a regular basis, your brain will start to realize it and try to compensate during your stroke. This can be a hard habit to break! To avoid these potentially game-changing issues, let’s make sure you’re aligning yourself and the putter toward the intended target. Getting your putter and ball to your intended read is way more than just setting the putter up square to the ball and line. You need to focus on your head position, eye position, and how you line up to the ball up at address. When it comes to putting alignment, your setup position has a huge impact, specifically where you position your head. The way that you lower your head over the ball determines how accurately you see the ball and your aimline. Ideally, you want to set up with your forehead and chin level so you look vertically down on the ball. You don’t want your head tilted up. If your head is too high you have to turn and lift it instead of swiveling. This also makes it very difficult to square the putter up at impact. 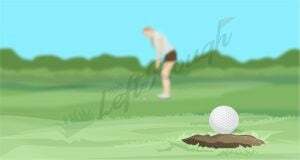 Lastly, make sure to keep your head down through the putt. If you peek and look early, it’s easy to miss putts to the right. Stay disciplined and try to listen to the putt go in instead of seeing it, especially one the short ones breaking right. If you dropped a golf ball from your eyes straight down, where would the ball hit? Would it hit on your ball, outside or inside? While this might not seem like a big deal, your eyes play a big part of you see the line. This is the one method that you almost never see any successful putter use on the greens. If you read any golf instruction book, get a lesson from any PGA coach or watch any tournament, no successful putter does this. While they might have different strokes and different grips, their eyes are never past the ball. If your eyes are out beyond the ball, you will tend to perfect your target more left than it really is. This will cause you to compensate by pulling towards the target on your putting stroke and missing left. The great putting debate happens with coaches and players discuss if your eyes should be directly over the ball or slightly inside the ball. Old school methods said you should be able to drop a ball directly from your eyes and it would land your golf ball. 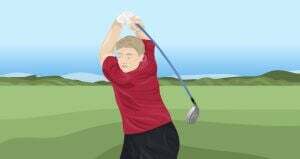 Your eyes should be on the same vertical plane as the ball and your aimline or marginally inside but never outside. This setup will deliver your line of sight in a straight line to your target. Ultimately, it’s up to the individual and your own preference and perspective at address. Personally, I prefer my eyes to be slightly inside but you don’t want them to be too inside. If your eyes are too far inside the ball, you tend to see the target too much to the right. This will cause you to compensate by pushing towards the target on your putting stroke. Another important part of aiming your putter square is understanding how your dominant eye plays a role. If you’re right-handed, your dominant eye will be most likely be your right eye. If you’re left-handed it will most likely be your left eye. It’s important to know because you need to make sure your dominant eye is behind the ball when you are lining up your putt. If your dominant eye isn’t behind the ball, even by a small amount, your target might seem off the side than it really is. 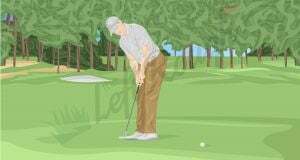 Now that you have your head and eyes aligned properly, it’s time to line your up your ball to the intended target. The other great debate with putting alignment is, “Should you use a line on your ball?” Some of the best players in the world say yes while others will say no. In Tiger’s 14 major championships and 80+ wins, he never used a line. To me, a line is beneficial for some but also not helpful to more advanced players. If you’re brand new or still shooting in the 90’s, I recommend using a line or the logo part of the ball (i.e. the arrows on a Titleist Pro V1) for alignment. This visual representation can give you confidence over the ball and help you line up square. But if you’re a more seasoned golfer shooting in the 70’s or 80’s, I recommend skipping it. I actually prefer to not see anything on the ball at all. In my opinion, a line takes away the feel part of putting and makes it feel more mechanical. Not to mention that putting with a line can sometimes get in your head and actually give you doubt before you pull the trigger. 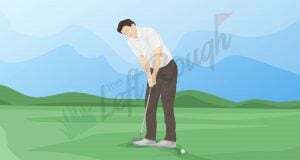 For example, if you can’t seem to get it straight to your intended line or have a line on your putter, it might feel like a task to get it set up properly. Again, this is a personal choice and there isn’t one right answer. At the end of the day, I recommend trying both options out on the putting green or in some casual rounds and see which ones gives you more confidence. You want to choose the method that makes you feel like you can hole every putt you look at. Once you have the right set up position, it’s important to commit to your read. I recently discussed how to read greens and encourage you to learn more about that here. 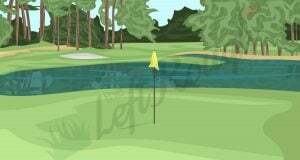 Let’s say you read your putt and determine its going to break 18 inches from right to left. Some golfers can’t “see” the line. If this is the case, make the read and pick a spot in front of your ball to hit the putt. The goal is to imagine the ball rolling over that spot and then turn the full 18 inches into the hole. This makes it easy to focus on a small target (like a discoloration in the green or a grain of sand) as opposed to picking a spot in the distance. 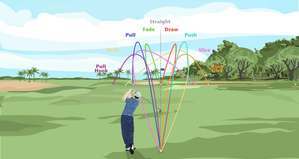 Other golfers who are more right-brained, visually oriented prefer to find the apex like Tiger Woods. Let’s’ say you have that 18-inch putt again. If you’re more visual, you would find the apex spot on your line and try to hit it there. The goal is to pick a spot in the distance at the point where the putt is going to break the most and start coming back to the hole. 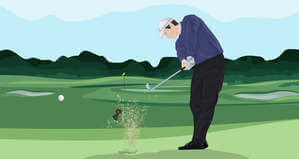 Try to pick a divot, old cup or discolored grass to not lose your mark. Here are some of my favorite practice drills to help you aim your putter. One of the oldest and most trusted putting drill for alignment is the old chalk line. A chalk line can give you instant feedback to see if your ball is starting online or not. Watch this video to setup the drill and hep you get started. Dave Pelz is widely considered the best short game teacher in the golfing world. One of his devices, the Putting Tutor, is one of the best ways to work on your alignment and your stroke. The device is small and compact so it’s easy to transport or keep in your bag as well. With the putting tutor, you can aim it toward the apex of your putt and ensure you’re hitting the ball square. If you mishit the putt you also get instant feedback. This device helps with your line and speed. It’s also the go-to putting device of Phil Mickelson so you know it’s helpful! So How Do You Aim Your Putter? But even if you master all of the above, with bad aim you will not make the putt. As you can tell there is much more than just setting up square to your intended target. Aiming your putter is about having your head and eyes in the right position more than anything. Once you set up squarely to the target and choose to use a line or not, it becomes more automatic. Make sure to try out both ways to aim your putter and figure out the best method for you. Lastly, use these devices and drills to hone your putting and set yourself up for greatness in your next round.